June 21st is a crucial date in the cosmic calendar. The Summer Solstice is a festival celebrated by many cultures all over the world, including Aborigines, Hawaiians and Native Americans, but in the UK and some other parts of Europe it was primarily a Celtic fire festival, representing the middle of summer, and the shortening of the days on their gradual march to winter – a dual celebration of all that had manifested during the outward cycle of the sun, and of the return to the dark side of the year, the exploration of the inner world, inner wisdom and inner development. At the Summer Solstice the trees are in full leaf and blossom, herbs and flowers are flourishing, as are vegetables and fruits, and to echo this, the Solstice is seen as the peak of our expressive and expansive selves, so it is a time to celebrate what you have achieved and manifested, a time for the enjoyment of what you have, and what and who you are, a time to focus and charge with healing and positive intent all you wish to be, do and have. It is a transformative time, bringing spiritual strength, awareness, rebirth and completion of our whole selves, so summer solstice rituals are good for success, happiness, strength, identity, wealth, fertility, career and travel. I enjoy getting up before dawn at the Solstice and going out into the countryside, preferably on a hill facing East, so that I can greet the rising sun - it can be a really profound thing to do, connecting you to nature - but please don't look directly at the sun, as that can harm your eyes! 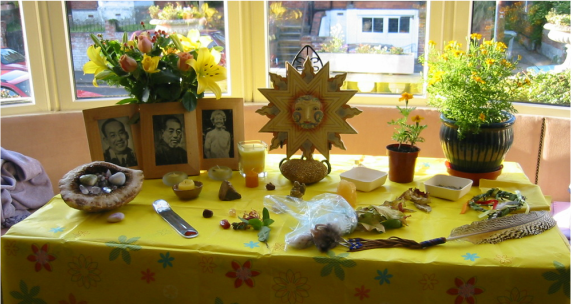 It is traditional to create a Solstice Shrine, placing yellow, gold, orange or red objects, candles, feathers, crystals, herbs (especially lavender, elderflower, lemon balm or St John’s Wort), rose petals or other special items, preferably on a yellow cloth, as a focus for contemplation, so this might also be something you'd like to do - an example above from one of the Summer Solstice Retreats I used to lead - but yours doesn't have to be so complex! I shall be giving two talks at the Holistic Health Show at the NEC in Birmingham, on behalf of the FHT (Federation of Holistic Therapists) for their members. Stress seems to be endemic in modern society, with most of us dealing on a daily basis with hassles, frustrations and deadlines, as well as work and home life demands, but if you’re constantly running in emergency mode, your mind and body pay the price. In this seminar, Penelope Quest will explain what stress is, what damaging effects it has on your body and mind, and how using Reiki in a variety of ways can help to relieve stress, promote relaxation, and create a more balanced and harmonious life. Find out whether your current stress level could be putting you at risk of ill health, and have the opportunity to practice a number of special Reiki techniques for you and your clients to clear stress from your energy field, as well as traditional Reiki meditations and specific hand positions to help with healing the effects of stress on the body and mind. Reiki is not simply about healing others – it is also about healing yourself, and growing both personally and spiritually. This seminar is about how you can incorporate the Reiki Principles/Precepts into your life every day, because they are as relevant today as they were for Mikao Usui a hundred years ago. We will look at the origins of the Reiki Principles/Precepts, their meanings and implications, and learn how to chant them in Japanese as a meditative practice. We will also cover some simple and practical ways to cope with anger and worry, develop an “attitude of gratitude”, explore the benefits of kindness, and the advantages of living mindfully “in the now”. Having the Reiki Principles at the centre of your life helps you to change, let go of destructive patterns of thinking and feeling, and live thoughtfully, kindly, generously, gratefully, calmly, confidently, considerately, diligently, conscientiously and happily!